2 different pliers in 1 tool. Flast nose regular jaw; for gripping, turning and forming. Long nose jaw; for tight work spaces. Cuts up to a 10 ga wire, strips 12 ga and 16 ga wire. 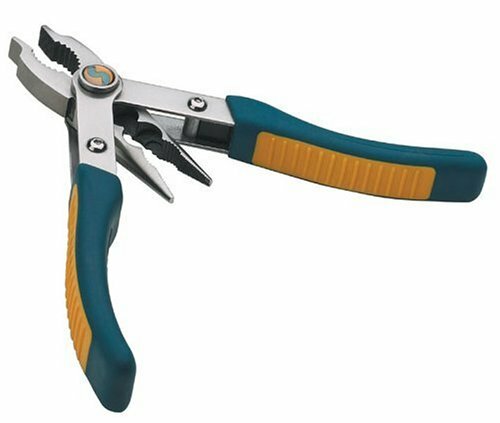 Size: Switch Grip Two pliers in one - simply switch the grips for the tool you need! The flat-nose jaws hold tight for turning and gripping. The long-nose jaws are idealfor working in tight places. Cuts wire up to 10 gauge; strips wire up to 12gauge. Spring-loaded jaws are forged chrome nickel with precision-machinedteeth and cutting edges. Ergonomically designed grips mean long-lastingcomfort and performance. Pieces (qty. ): 1, Handle Type: Ergonomic, MaterialType: Chrome nickel From the Manufacturer 2 Different pliers in 1 tool. Flat nose regular jaw for gripping, turning andforming. Long nose jaw for tight work spaces. Cuts up to 10 ga wire, strips 12ga. And 16 ga. Wire.